A little like the now defunct Rising Thunder, Metal Revolution aims to deliver a robot fighting game with plenty of depth, but where you don’t have to memorise massive button combinations to pull off moves. Its minimalistic controls mean that newcomers will be able to easily master basic moves, specials and even use powerful combos. There’s also a unique defensive blocking mechanic that allows you to counter an opponent’s attacks while passively blocking. The easily accessible fighting mechanics of Metal Revolution doesn’t mean it’s a button masher though. It just means that instead of memorising button combinations you’ll be able to focus on what’s most important in high skill levels of fighting games – timing and reacting to your opponent’s attacks. It’s a great looking game and it’s nice to have a fighting game where where the barrier of entry is low, but there’s still plenty of skill based combat to sink your teeth into. 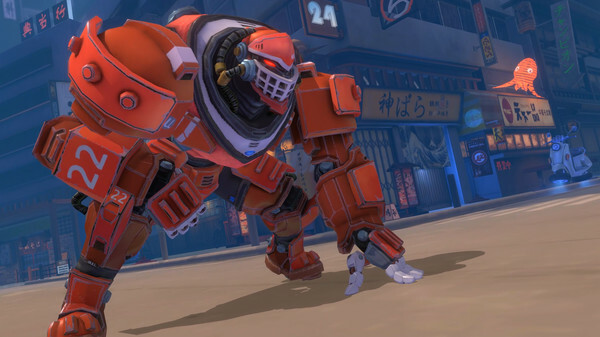 The roster of mechanical combatants all look pretty badass and they offer a nice variety of fighting styles – from agile sword wielding ninjas to big bulky bruisers. Sign up now to prove if you’re made out of real steel or scrap metal! Thanks so much for the positive press! We love to hear it when other people GET our game and what we’re striving to do with it!